Josh Kellier wasn’t afraid to try something new, or get his feet wet, both literally and figuratively, when he decided to take on the steeplechase event during his track and field season this year. Now, it’s that decision that is sending the Chatham, Ontario runner to the Legion National Youth Track and Field Championships in British Columbia this August. 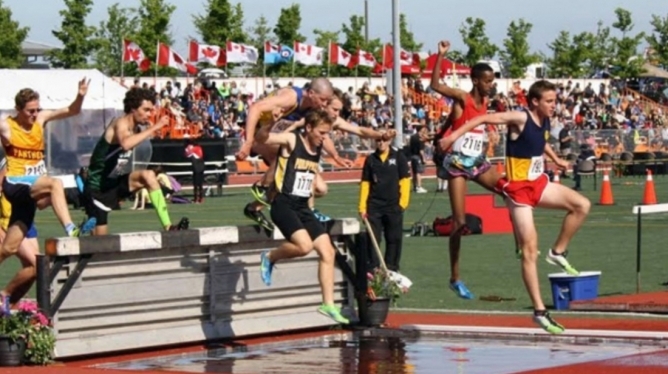 Kellier, a Chatham-Kent Secondary School student, won gold in the 2000m steeplechase at the Ontario Legion Provincial Championships in Brampton this July, earning his spot on Team Ontario at the National Championships. “It feels great to make Team Ontario,” says Kellier, who won with a time of 6:04.41. “Not all the winners from Provincials are chosen to go to Nationals. They have a limit of forty athletes and the decision comes down to who will be able to compete at the National Level. I am very fortunate I was one of those athletes and very thankful,” continued Kellier.